As the grafts settles in the skin they get a homely environment & start re-growth delivering you a healthy and natural hair growth. This process does not require any bandages and you may touch the implant with your hands. Though after some time few hair bulbs may fall out but the original implants are safe inside the scalp. The process is also less time taking and has assured results which make it the customer's choice. Though like every other medical surgery the therapy demands expert supervision for effective results. 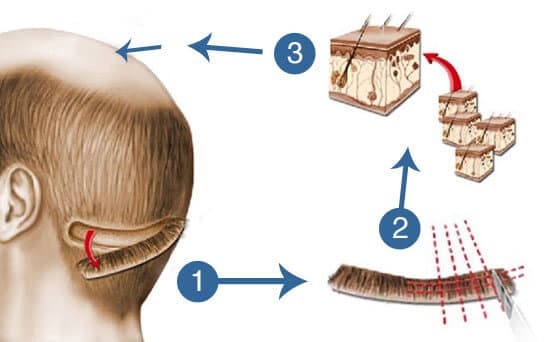 Longer Recovery Period - This is a treatment which has a little longer recovery period of donor area in comparison to other hair transplant techniques. Additional treatments causes harm - If you go for additional FUT sessions it may result in stretching of the scalp and a long linear scar. Stitches oriented method - The method requires stitches to close the excision properly. This makes it a little-complicated method. Restraining activities - As the therapy involves stitches it restrains you from any strenuous activities for a week or so. Scarring - The surgical method is known for leaving the signs behind though the scars are not very big and identifiable. A few side effects - The process involves a few side effects like hemorrhaging and infections. However if you follow the doctor's advice then the chances of these side effects to occur are minimal.